The shipping lanes along certain fringe zones between warm & cold currents and opposite bodies of water are going to become hazardous due to sudden shifts of bodies of waters and currents due to the rocking motion of the Earth as the tilt adjusts to the slow moving turn of the north pole of the 12th planet. With the 12th planet moving into a magnetic comfort zone of the Sun where both poles will soon be parallel to the tangent line of Earth’ orbital path as the North Pole of the 12th planet rotates towards Earth and the South Pole away within the plane of the ecliptic, wobble will become extreme as the poles of the 12th move another 90 degrees and the north pole of the 12th planet faces the Earth. The wobble will take the motion of a slowly spinning top as the axis of the earth forms an ever-widening circle. The swaying of the large water basins will force cold water over warm waters quickly with disastrous results. The major problem occurs when tilt forces cold water away from the warm currents first, stops, thus creating high tides on the extreme end then reverses and forces this mass of accumulated water into the warm currents creating a line of whirlpools separated turbulent static channels between them. The cold water forced over warmer water due to the wobble of the poles will sink in conjunction with the rotation of the Earth a spin or water vortex will form at random areas in the oceans of the world where two bodies of distinctly different water temperatures co mingle, but a pattern will develop. Ships will be pulled under with little warning with the only remnant trace, scattered debris floating on the turbulent surface. The second affect will be the change in the jet stream flows and how air masses interact. This will bring the about the advent of the super storms were 2 distinct air masses will be forced together suddenly and the front will be a source of devastation not seen in recent history (Category 6: Day of Destruction, the recent CBS TV movie is closer to the truth than not). Not so much in magnitude, but some will be near the extreme end and hurricanes should not move above 250 mph. due to the atmospheric friction with the land masses as opposed to the sheer number of occurrences. So how will events on Earth give us clues? At points where the tilt is affected, the Moon or Sun will move swiftly north or south in the sky basically at the same times during the day or night with a few erratic rotational spirals in the sky near initiation of darkness for the Earth’s northern hemisphere. Events unimaginable in mankind’s mind like the Sun setting, then reversing and rising in the evening sky only to set again. The Sun setting in the western sky and then rising in the east less than an hour later in the lower 48. The extreme wobble will lead to one event, with the north pole of the 12th planet pointed directly at the earth, the poles on Earth will respond by linking in the same temporary horizontal formation. 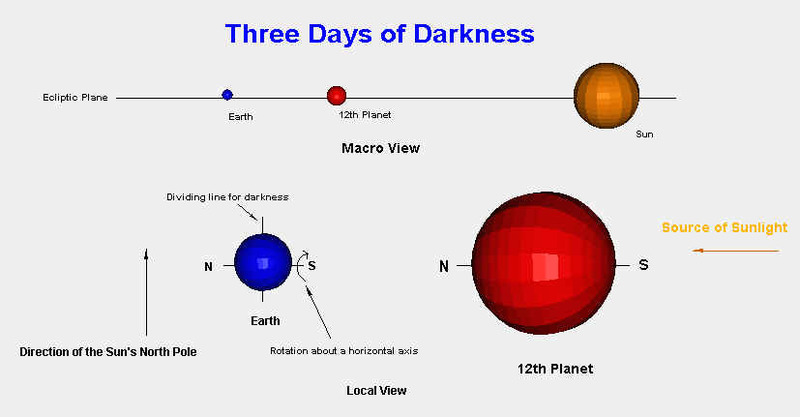 Resulting in 3 days of darkness for the northern hemisphere as the Earth rotates on it side (details below). Both the Bible and Zeta Talk predict this event. The wobble effect is a little more complicated than an attraction or repulsion of a pole towards or away from the 12th planet. The rotational spin of the Earth causes the North and South Poles to spiral outward from the center of gravity slowly instead of conventional wisdom of to and fro while simultaneously tilting away. The movement can be seen in a top that slowly loses its spin due to friction and its axis wobbles more to the extreme as the speed of its rotation slows. This motion on the whole of tilting to and from the 12th planet is dependent upon its pole position and the location of the Atlantic Rift and the Earth's magnetic poles, which are moving due to a liquid core. The spiral effect is where the Earth's poles wobble in an ever increasing radius about the center of gravity for the Earth. Earth Wobble a series of moves by the its North Pole that is pushed out and away due to the evasion magnetic repulsion subatomic particle flow between the like poles on Earth and the 12th planet. The snapback crosses over its outgoing path due to momentum and finally settles at its origin due to magnetic alignment with the solar system govern by the magnetic field of the Sun. This movement will expand within the expanding conical spiral, which is closer to a hyperbolic instead of the linear cone illustrated diagram 1. Over time the force pushing away increases in volatility and crossover points increase fulfilling folklore of Earth movements like that of a drunkard. 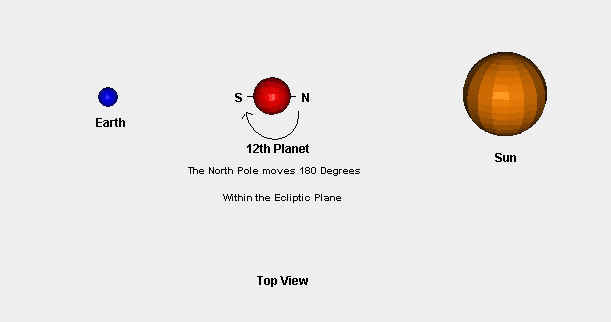 As the 12th planet rises in the ecliptic, in this top view or looking down towards the North Poles of the Earth and Sun, we can see how the 12th planet's North Pole rotates away from the Sun. The slow roll of the 12th planet's north pole away from the Sun with momentum carrying the swing 270 degrees from its present position facing the Sun. Here we are looking at a two dimensional representation of the Earth and the 12th planet as the 12th rises above the ecliptic and encounters the magnetic variances associated with the North Pole of the Sun. The north pole of the 12th planet sides along the ecliptic plane to the west as the south pole moves in unison to the east. As time progresses, wobble moves to a greater extreme as we approach darkness in the Northern Hemisphere. A point to where visible movement up and down to the Earth's horizon of the Sun and Moon becomes evident to all. In this illustration, reference points (positions 1-3) are set for the movement of the 12th planet's North Pole as it moves through the various positions during its 270 degree slow roll away from the Sun and eventually points temporarily towards Earth. Momentum carries the 12th planet pass position 3 to the diagram's position of the South Pole of the 12th planet and slowly oscillates the North Pole into the position of 3 due to the magnetic dampening factor of the Sun. The reaction points for Earth (positions A-F) are detailed in the following Table "Tilt Movement of the Earth"
*The Atlantic Rift is in the form of a S so there will be subtle anomalies in the tilt responses, but it is the average total response that will be considered. Wobble is now beginning to be recorded by some observatories around the world as this piece of information was released by the Paris Observatory. 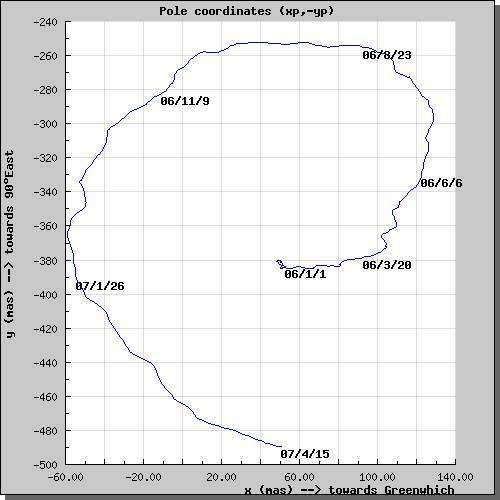 Primarily atmospheric mixing where the extreme temperature differentials between the conventional hot and cold air masses during the Summer and Winter seasons will be tempered due to the mixing and in the Summer there will be a humidity creep into what would normally be dry areas. Thus border desert like areas will become unbearable. In the earlier part of Earth wobble certain areas where mixing occurs, cooler summers and milder winters escalating in the area affected as the wobble increases a general blending of the atmosphere. This will be a gradual transition where the difference between the seasons tend to meld together with less differentiation. Storms will appear out of nowhere as Earth wobble mixes different air masses not expected to be brought together by current weather models with disastrous results. Incidents of tornadoes are rare along the ocean coastline as the differential between the air and water shears the formation of rotational funnels forming due to on and off shore winds, but this will change. Earth wobble will moderate the temperature differentials between the land and ocean delaying the start of on an off shore breezes due to the heat of the Sun. It is when the wobble forces an intense pocket of cold air quickly over warmer stable coastal land air mass before the sea breezes starts does environment for the perfect storm develops. So how do tornadoes form and what perpetuates their existence during extreme weather phenomena? First the Coriolis Effect only initiates the counterclockwise rotation in large air masses in the Northern Hemisphere. This is an effect as the tangential force that affects the edges of air masses due the frictional coefficient decreases as one moves away from the equator. So the dominant force to the south of an air compared to its northern fringe in the Northern Hemisphere dictates on an initial level a counter-clockwise rotation or spin of descending air mass. Normally, super cell thunder storms provide the differential in temperature extremes of the warm stable air mass moving across a land mass versus the extreme cold top of the cells to initiate tornadoes. As the cold air drops, it favors the pressure differential to the south due the rotational spin of the Earth. The colder the cloud tops, the faster the drop of the air mass forcing a warm air updraft. It is this sequence of events that the tornado develops. As the air mass drops with a rotational favoring a counter clockwise rotation air pressure rises on the thin cold air mass as it approaches the surface. So what was a slowly rotating thin massive cold mass starts to drop in a column and the natural air press starts compressing the column as it descends. As the column rotating air nears the surface and the pressure increases against its perimeter the classic funnel shape takes form as the pressure compressing the dropping air is greatest at the surface. Secondary, rotation spin increases as the diameter of the funnel decreases, conservation of momentum related to spin. As the column shrinks in diameter the surrounding warm air mass expands as a result of the contraction of the funnel, thus creating the low air pressures associated with these storms. The directional path of the tornado may seem random, but it moves constantly in the path of the least resistance as the warm air rises it is not uniform and the tornadoes within an air mass shifting about towards the perimeter with the least air pressure bouncing back at the funnel on the ground. As Earth wobble becomes more abrupt and violent, the land underneath the ocean basins will faster than the water in response, thus the unusual high tides flooding land past all recorded highs. At first the media will explain this as unusual high tides, rogue waves or silent tsunami large waves associated with Earth movements, but no event large enough recorded to cause it. Small islands will be wiped clean with no explanation as to why with all caught by surprise. Low lying areas will be devastated not so much as to lost of life at first, but salt water intrusion to the farming areas destroying all crops and the ground water supply. As the Sun sets further and further south controversy will arise between the obvious version of events presented by Zeta Talk, which is becoming more and more confirmed and the prophecy in the Bible stating the whole world will be pushed into total darkness for 3 days, and wedge develops between science and religious prophecy. So how can both versions of events be true? As a civilization moves from its infancy to be reintegrated back into the community of the universe, God and his values becomes more profound and must be interwoven into the fabric of everyday life. It is no different than comparing mankind's knowledge of the almighty with the caveman vs. present day life. As we move through the pole shift mankind will make a similar leap. Now to answer the question, yes, both versions are correct and I will state how. Zeta Talk written solely by Nancy "Braveheart" Lieder have described 3 days of darkness for the Northern hemisphere and this is true, but this version did not give the full picture of all events by choice. I just want to thank God and them for allowing me to fill in some of the holes. As the North pole of the 12th planet and Earth's South Pole lock together due the magnetic attraction the distance between the 2 planets closes dramatically with only the repulsion force preventing collision between the two. The Earth rides higher than the 12th planet due to the repulsion force and southern approach of the intruder. Thus, the angle between the planets to the ecliptic and the angle between the 12th planet and the Sun become equal creating a very rare planet to planet solar eclipse as the 12th planet blocks the Sun while the Earth traverses in its shadow for 3 days. Thrusting the Southern hemisphere unexpectedly into darkness and the appearance of the blue star (Earth Twin) fulfilling the prophecy, a point where the spiritual version now works with the scientific version seamlessly. During this encounter, the magnetic fields of both planets rotating in opposite directions will eventually spin about a common imaginary axis with charges building to a maximum around both planets as charge particles get pushed about the magnetic lines of force. Progressing slowly from curious auroras, to an ionosphere gone crazy and finally to dramatic super bolts with its damaging EMP pulses. All happening as the charged red dust particles in the tail of the 12th planet takes up a static position around the Earth slowly turning the night sky red all foretold as the stars seem to bleed. So disruption of power is commonplace, planes unsafe, operation of financial networks unreliable and satellites intermittent depending upon shielding. All will be very hard if not impossible to hide in the weeks to months preceding darkness from a restless public. What has not been considered is that the 12th planet and the Sun close in distance as its southern pole is magnetically pulled towards the Sun's north. While simultaneously being pulled slightly above the ecliptic, as this distance closes the repulsion force builds dramatically and the particle flow returning to the Sun forces the 12th planet down into the ecliptic. At the point of equilibrium the 12th planet again starts to align with the Sun north - south relationship, magnetic attraction countering extreme repulsion force is quickly reduced. It is this imbalance in the repulsion force that give the pop forcing the 12th planet to leave the inner solar system with great speed. In the macro view we can see the Earth riding slightly higher than the 12th planet above the ecliptic, as we switch to the local view for a close up what is left out is the equator does not dictate the dividing line as the South Pole is tilted in a direct relationship to its elevation above the 12th.